JNF/KKL sponsors conference responding to escalating anti-Semitism in France presenting options for mass French Aliyah. A brave move: a pro-Zionist demonstration will be held outside the Les Palais Royal Sunday, a very public show of support for the struggling French Jewish community in the wake of waves of anti-Semitism there. The Jewish National Fund (JNF)-Keren Kayement L'Yisrael (KKL) sponsored the demonstration and conference, entitled "Israel Today and Tomorrow." 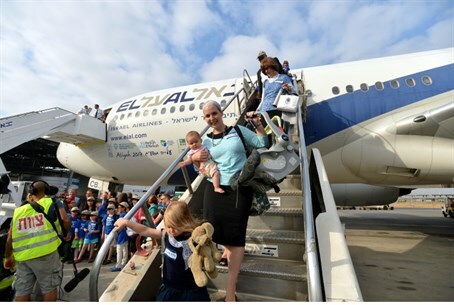 Four Israeli ministries are participating in the conference - the Defense Ministry, the Ministry of Immigrant Absorption, the Agriculture Ministry and the Ministry of Tourism - to demonstrate the benefits Israel will provide to French Jewry in the event of mass aliyah. The ministries will provide information on real estate, career options, and other opportunities awaiting the new immigrants. Professional conferences and networking panels will also be held at the event. The conference will be surrounded by an unprecedented amount of security forces after anti-Semitic and pro-Palestinian groups have vowed to disrupt the event with counter-demonstrations and other disturbances, according to JNF sources. At least one threat came into fruition already, when a cyber-attack was launched against the website for Les Palais Royal, branding the site with hate messages against Israel. The event's organizers refused to be deterred, however. "Whoever wants to see the true face of Israel is invited to see the facts," JNF chairman Efi Golland stated. "Whoever wants to boycott us and shout slogans against Israel will remain outside." "France is the heart of Europe. Paris is the heart of France - and we will present the real Israel here in the heart of Paris. Protests and threats will not deter us, and on the contrary they only prove how right we are," he added. In general, it has been widely known for years that anti-Semitism has been skyrocketing in France. One report revealed that anti-Semitic incidents rose 58% in 2012. Anti-Semitic attacks have been escalating considerably in the past year in particular. The ongoing crackdown against anti-Semitic comedian Dieudonne M'Bala M'Bala has revealed the normalcy of anti-Semitism as part of popular opinion and culture; over 5,000 tickets sold in a short period for the comedian's opening night despite condemnation from French politicians and the French media. Fears have sharpened drastically since a huge anti-Semitic rally was held on the eve of Holocaust Remembrance Day last week, with over 17,000 protestors participating in a march which featured leaders screaming slogans against Jews and denying the Holocaust. The conference signifies the beginning of the government's efforts to prepare for mass French immigration into Israel, after reports surfaced that French Jews have been fleeing their native country en-masse and moving to other Western nations for their safety. To realize these goals, the government is set to provide significant aid to new French immigrants. Some of these include easier license transfers for professions - including accounting and medicine - and greater allowances for business owners to open branches on Israeli soil. Youth programs will also be expanded to cater more toward French Jewry. The MASA program, which provides pro-Israel community and activities in a one-year program framework, and the Taglit/Birthright trips, which bring young North Americans to Israel on a free tour, will also be expanded toward that end. The program will be limited to three years, and the target is to double the number of immigrants each year: 6,000 in 2014, 12 thousand in 2015 and 24 thousand in 2016.